The tone of your voice can make or break your dog’s recall! "I try and get Missy to do as asked in the quietest and gentlest voice I can use - I will raise my voice slightly with distance and this seems to work well. The only time I will use a loud voice or shout is if it involves safety or urgency but poor Missy gets upset even though she does as asked. She cowers and skulks when she comes back to me. She gets lots of praise and top value treats but still takes a bit of time to become the happy pup again. Any suggestions for a less scary way to get her back in those circumstances?" This is a good question from a reader! In the heat of the moment, fearing for our dog’s safety, we run the risk of sounding harsh and worrying. In our efforts to get our dog back as fast as possible, we let our anxiety come through and bark sharp commands at the dog. Your dog - used to your lovely, kindly, friendly, calls - is nonplussed and worried, and will actually return much more slowly, if at all. Dogs are sensitive to the nuances in sounds. And some are super-sensitive. So you may need to lighten up, lift your voice. Think of a mother talking to her baby and make those sort of singsong sounds. Our questioner says he raises his voice slightly, which works - and only shouts when it’s urgent. He’s on to something here. Projecting your voice, as singers do, is a skill. You need to be able to project the sound, with the same expression - and without shouting or yelling. This may take practice. One way to develop this is to picture a spot some distance away - a tree, perhaps - and see if you can get the tree to hear you and your message, without distortion. It’s an old singing trick to pick a listener at the back of the hall and sing to them. It helps you get the sound a long way without changing the tone. So practicing that would be a good first step. Keep your anxiety to yourself! And then you have to know how to react when something worries you. Your dog is racing towards a road - you’re likely to panic and yell urgently. And this is what’s upsetting gentle Missy. So take a second, take a good breath, think of how you usually call your dog, and project your voice as you did to the tree. This way your dog will hear you calling in your usual friendly way without the anxious tension. You’ll need to think of the sound of your call. Perhaps you usually call Missy in a tuneful, singsong way, “Miss-eeeee!” She knows this sound and races back. In your anxiety you may bark “MISSY! !”, which evidently worries her. I’m just as guilty as you! I have called my dogs abruptly when there’s a safety issue, and ... it doesn’t work. Once I pause and think and produce the right tone ... it works perfectly! Missy’s cowering and skulking, by the way, are calming signals to you. She’s showing that she’s no threat by creeping around you, probably also blinking, looking away, maybe licking her lips, yawning, wiggling, and a host of other body language from the dog’s extensive repertoire. 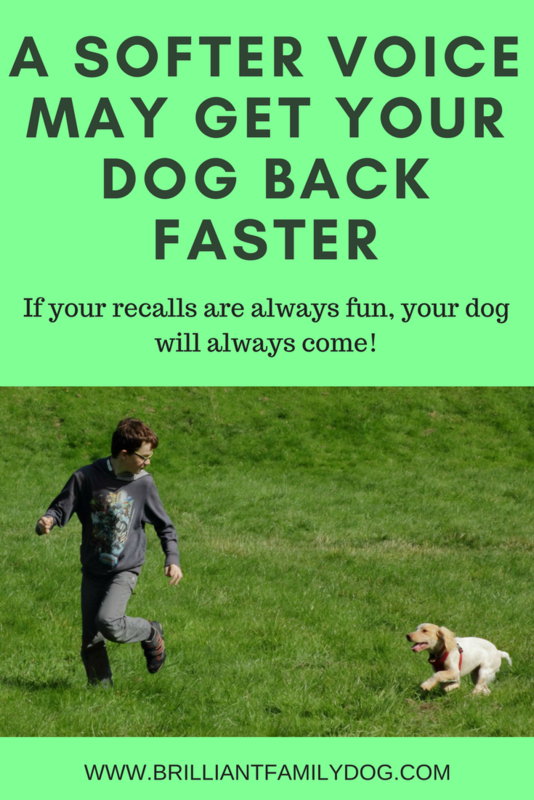 It sounds as if you have a good recall, and you always reward your dog well for returning to you, which is great. You want to practice these recalls as games, frequently. It’s a mistake to only use a recall - however many rewards your dog gets - in the heat of the moment. Recalls need to be a game you play regularly. Sometimes the reward is food, sometimes it’s catching you running away, sometimes it’s hurtling after a toy. Keep your dog guessing with your rewards - never be predictable! Once your dog will spin on a sixpence and hurtle back to you at the same speed as she departs, you need to “bottle” that and bring it out for every occasion - urgent or otherwise. Of course, if your dog is not 100% on her recall, you need to manage the situation and ensure that she’s always safe. This may mean keeping her on a long line if near a road, or if deer or bunnies are likely to hop out to tease her. Want a bit of help with this? My book Here Boy! Step-by-step to a Stunning Recall from your Brilliant Family Dog will get you going. And if you are the sort of person who needs to see the games demonstrated, you’ll love From Challenging Dog to Brilliant Family Dog - an online course with over 50 daily videos so you can get it right from the start! Yes, There can be good stuff on tv about dogs!